Benjamin James Bucknall was born in Yeovil in 1898, the son of railway engine stoker John Bucknall (b1873), originally from Lincolnshire, and Alice née Potter (1874-1964) originally from Chertsey, Surrey. In the 1901 census John and Alice were living at 34 Victoria Road with their three children; Annie (b1897), three-year old Benjamin and Julia (b1900). By the time of the 1911 census John and Alice's family had expanded to eight children with the addition of Frank (b1902), Lottie (b1903), Elsie (b1905), Arthur (b1906) and Alice (b1908). By this time John was a railway engine driver and had moved his family to 3 Montgomery Terrace, Bemerton, Salisbury, Wiltshire, in 1903. Benjamin enlisted as a Rifleman in 'C' Company of the 1st/16th Battalion (Queen's Westminster Rifles), the London Regiment. His Service Number 554085 indicating that he likely enlisted around February 1917. These six figure numbers were not issued in the regiment until February 1917, and all men with existing four-digit numbers were renumbered. It is rather difficulty therefore to tell when he actually enlisted. In any event, by this time the battalion had transferred to 169th Brigade in 56th (London) Division and served on the Western Front throughout the Great War. The 1/16th Queen's Westminster Rifles were involved in the Battle of Arras on 14 April 1917. At 5:30am on the 14th the QWR and the Queen Victoria's Rifles attacked from the Wancourt Tower Ridge with their objectives being another ridge 1,000 yards away and then the village of Cherisy. The men were exhausted having had one hour's sleep per day over the previous three days. As orders for the attack did not arrive until 11:45pm the night before, no reconnaissance of the ground had been possible nor was there time to explain what was required of the troops. A and B Companies were the first wave with the objective of the ridge at which point C and D Companies were to pass through and take Cherisy. Just before the British barrage started, the Germans dropped a heavy barrage on the QWR trenches. At 5:30 they went over the top on a bright, spring morning. As soon as they started to descend Tower Ridge they were met by heavy machine gun fire from front and both flanks. In addition, some Germans appeared on Tower Ridge in the left rear of the lead companies (Tower Ridge was not wholly occupied with parts still in German hands). British artillery were unable to suppress the German MG fire. The majority of officers were quickly killed or wounded but the men pressed on to some trenches 500 yards down the slope. By this time the first wave was nearly wiped out and only the arrival of the second wave allowed them to hold this position. By 6:30 am the attack was at a standstill and a counter attack was beaten off by Lewis gun and rifle fire. Contact was lost with battalion HQ on the Tower Ridge and, to add to their problem, there was a gap on their left flank which left it exposed. Units of the 151st Brigade that were supposed to fill the gap lost their way and ended up supporting the QVR to the right. By 6:50 the left company of the QWRs had been overrun and the Germans were working their way round the left flank of the main position. The attacks of the two flanking divisions had failed and so, by 8am, the QWRs and QVRs were in an isolated position some 600 yards in front of the main British trenches. Commanded by Lt W G Orr of C Coy they held out all day. Attempts to send messages back failed. By 9am both flanks of the QWR position had been turned and a group of Germans was seen in the rear of the QWRs. Because of the close proximity of the opposing troops it was impossible for the artillery to intervene. At 11am Orr's position, reinforced by a few QVR and some of the 6/Durham Light Infantry, was attacked but the Germans were repulsed. Fighting now died down and orders to withdraw elements of the QWRs were sent out. Eventually, a Lt Mackle found Orr's position and sometime after 5pm they withdrew. Of the 70-80 men initially under Orr's command some 27 were left. At 9pm Battalion HQ heard that Orr had retired and Brigade HQ then ordered him back and Orr and 15 men returned to their exposed position. Men of the 168th Brigade were supposed to relieve him but they too got lost and Orr and his men were left exposed all night, only withdrawing at dawn. The QWRs went into action with 497 men and lost 12 out of 15 officers (4 dead) and 256 other ranks (86 dead + 6 died of wounds). In July 1917 the 56th (London) Division moved to Ypres, and fought in the Battle of Langemarck at Inverness Copse and Glencourse Wood on 16th/17th August. Objectives were reached, but a strong German counter-attack threw the London Division back to its original start line. Casualties were 111 officers and 2,794 men over a five day period in the line, most of them as a result of the attack on 16th August. Following these operations the division withdrew from the line, and moved south to the Cambrai area, taking over trenches at Lagnicourt in early September. On the opening day of the Battle of Cambrai, 20th November 1917, the 56th (London) Division was involved in diversionary operations opposite Moeuvres, and two days later attacked and captured Tadpole Copse and the Hindenburg Line near Moeuvres itself. Here they remained in reserve while the fighting for Bourlon Wood continued. During the German counter-attack, the positions held near Tadpole Copse were overrun and the division forced back towards the old British front line. Casualties at Cambrai were 211 killed, 1,046 wounded and 369 missing. After Cambrai the 56th (London) Division moved to Arras, and took over the line between the Oppy and Gavrelle sectors. The German Offensive began on 21st March 1918, the divisional front being bombarded but not attacked. However, this changed a week later when an attack was launched on the morning of 28th March. A terrific bombardment ‘blotted out’ many of the forward positions, and some five German divisions advanced on the Londoner, and 4th Division on their left. Although some ground was eventually given way, the Germans were stopped with minimal losses to the London battalions – 55 officers and 1,433 men. The 56th (London) Division remained in the Arras area until the allied offensive, when they fought in the attacks on the Hindenburg Line near Boyelles, Croiselles and Bullecourt. By the end of August casualties were 123 officers and 2,381 men - including Rifleman Benjamin Bucknall who was killed in action on 28 August 1918. He was just twenty years old. Benjamin was interred in Queant Road Cemetery, Buissy, Pas de Calais, France - Grave IV.B.26. His name was added to the War Memorial in the Borough in 2018. 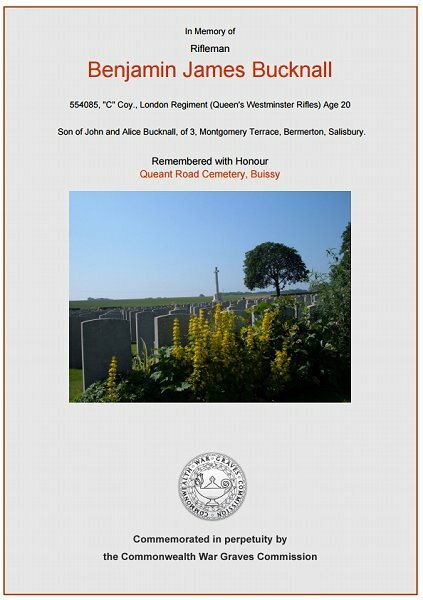 The Commonwealth War Graves Commission certificate in memory of Benjamin Bucknall.